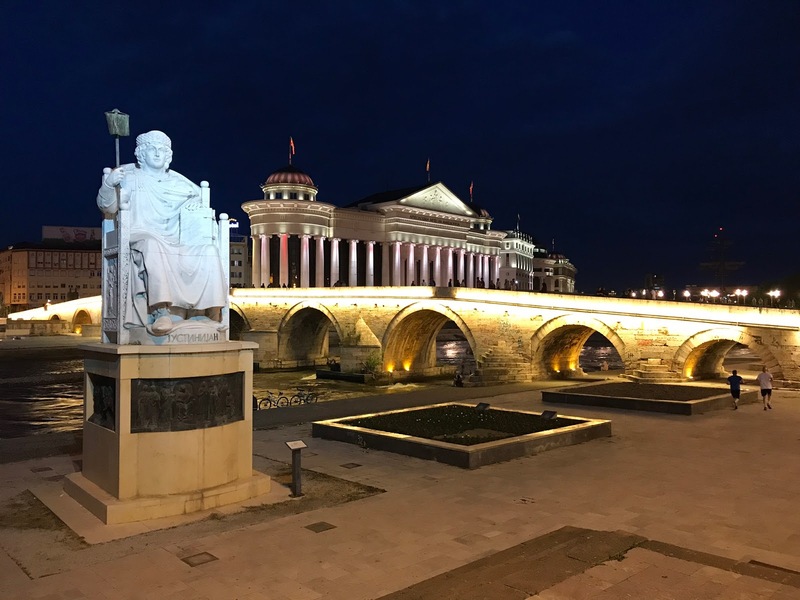 Balkans & Beyond, Days 50-52: Bitola, Macedonia to Skopje, Macedonia. Beginning in 2010, the prime minister of Macedonia initiated a massive building project, Skopje 2014. 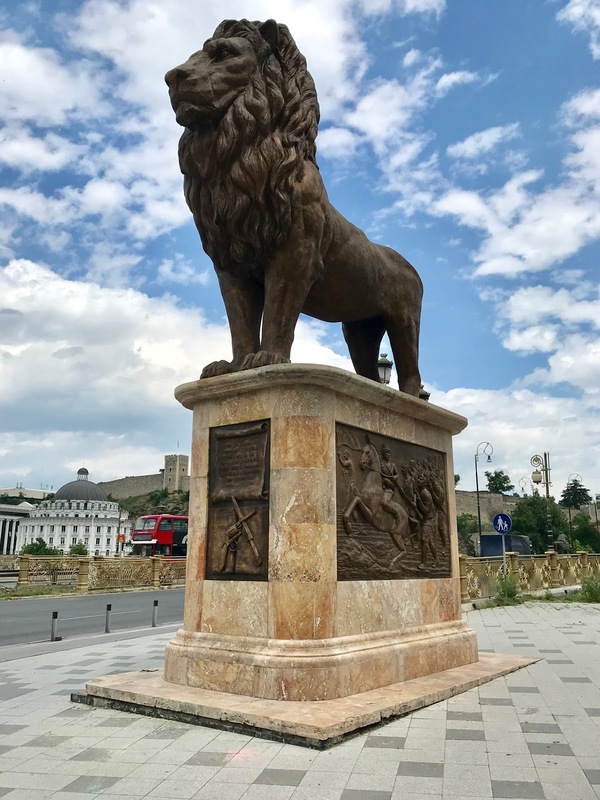 Its object was to fill the streets of the Macedonian capital city with oversized statues and ornate neoclassical buildings in an effort to historicize a city all but destroyed by earthquake in 1963. Perhaps, as some have suggested, it was all part of a plan for Macedonia to thumb its nose at its angry neighbor to the south. In addition to the Greek objection to the small country's use of the name Macedonia, the powers that be in Athens (and much of the population of Greek Macedonia) have been offended by Skopje's claim to Alexander the Great and other leaders of the ancient Kingdom of Macedon. And since the tiny country still needs the good will of its larger neighbor, they're willing to push things only so far. 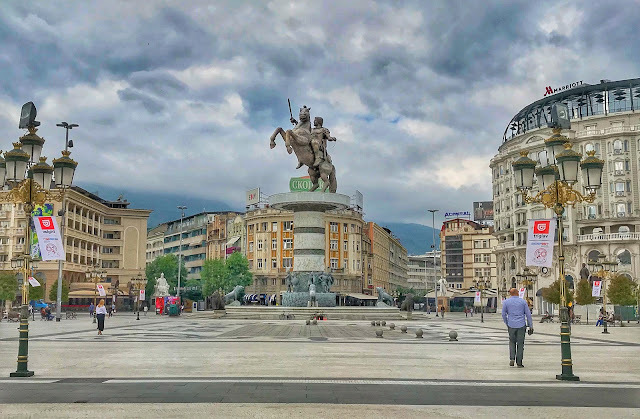 Even though they erected a 75-ft statue with an obvious likeness of Alexander the Great in Skopje's main square, the official title of the work is "Warrior on a Horse." But a little background is needed. In July of 1963, a massive earthquake destroyed about 80 percent of the buildings of the city of Skopje. 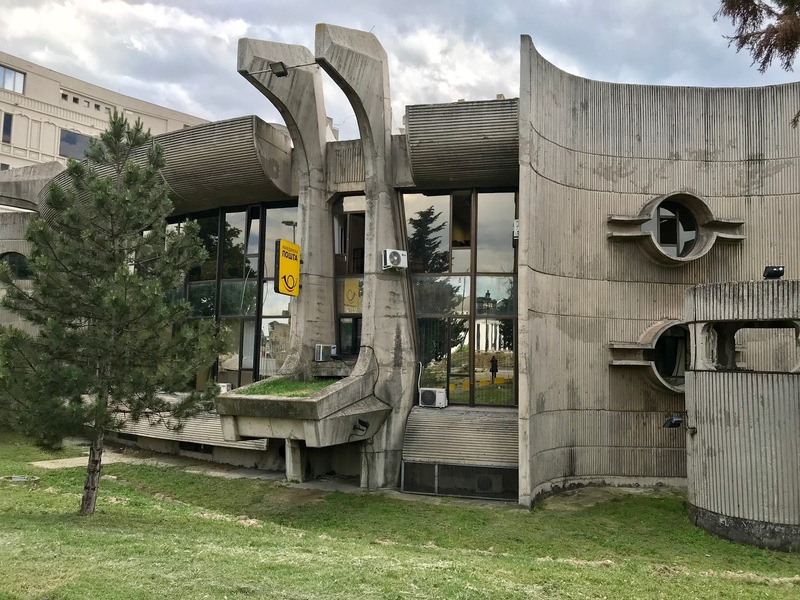 Much of the recovery efforts employed the concrete brutalist architectural style, then in vogue. The Skopje 2014 project camouflaged many of those modernist buildings with neoclassical facades highlighted by hollow columns and artificial sculptures. When first announced in 2010, the Skope 2014 project was to include construction of some 40 monuments, sculptures, renovated facades and new buildings. By 2015, the number of structures and monuments had tripled and construction continues. Though many, if not most, Macedonians objected to the massive spending project, the building pressed on with the installation of dozens and dozens of statues and the masking of many of the central city's buildings. Most of the project was confined to an area near the main square and its environs. And apparently no idea was too extreme. 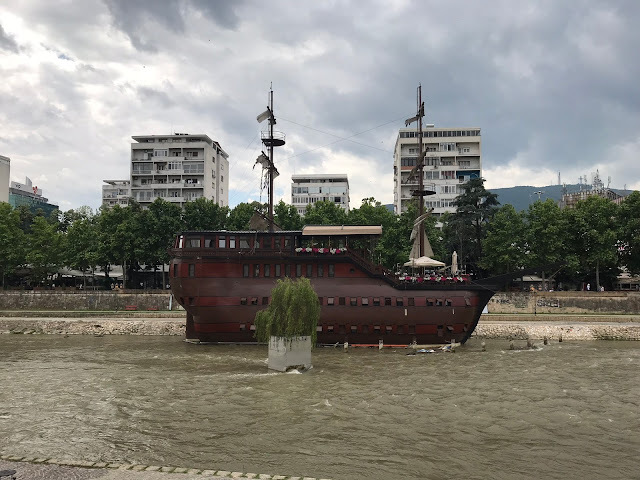 Park a fake boat in the river to serve as a hotel and restaurant? Sure, let's make it three! Plant some trees in the middle of the river? No problem! 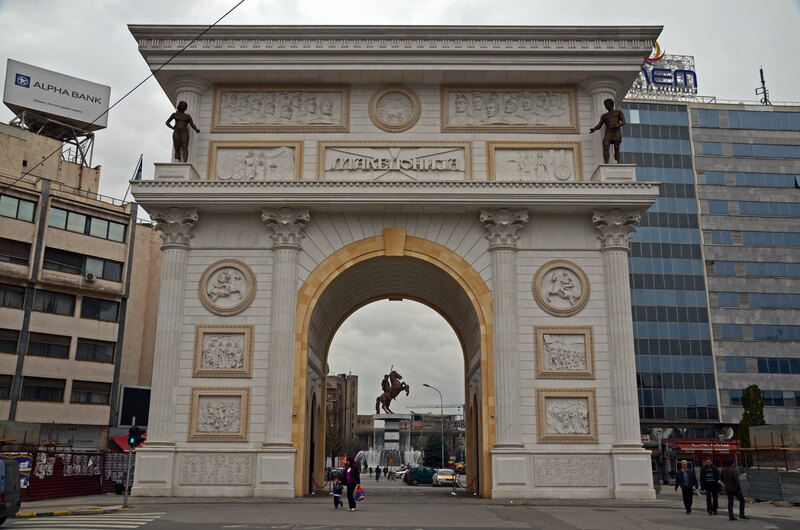 Clearly the Macedonian Arch borrowed some design inspiration from Paris. It comes as no surprise that both the design aesthetics and the scope of Skopje 2014 provoked controversy from the outset. 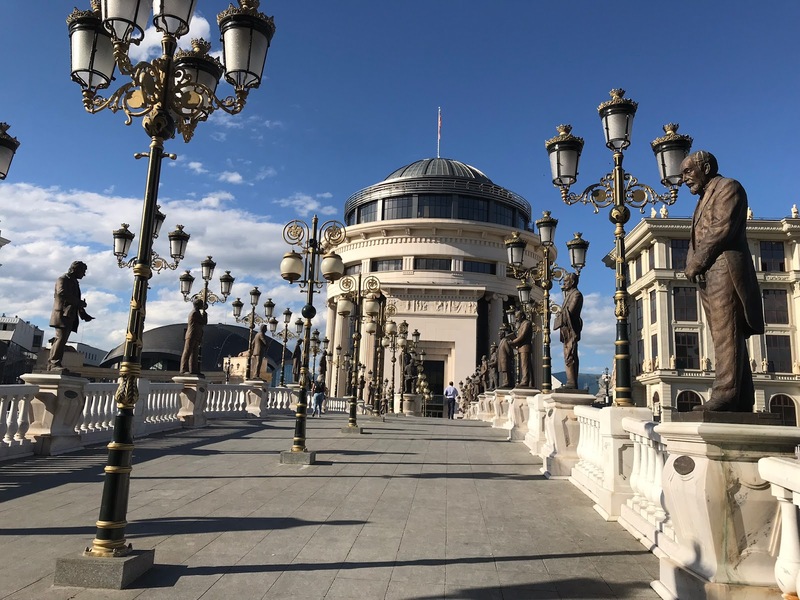 The government that conceived the project (which was ousted last year) insisted that the makeover would instill national pride and restore the historical feel of a city whose roots date back more than 2,000 years. Of course, colorful lights illuminate the new treasures by night. 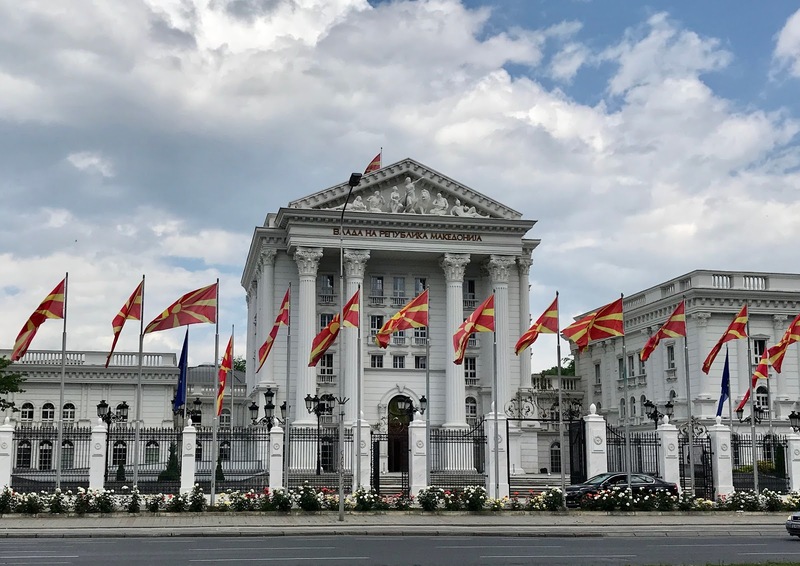 Detractors complained about the ballooning cost—from the originally announced €80 million to more than €670 million and counting—and the lack of transparency in noncompetitive contracts awarded to friends and relatives of government officials. 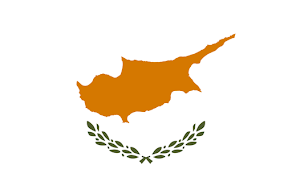 Others accused the government of using the project to distract from the country's significant problems with high unemployment, poverty, and stalled progress toward membership in EU and NATO. 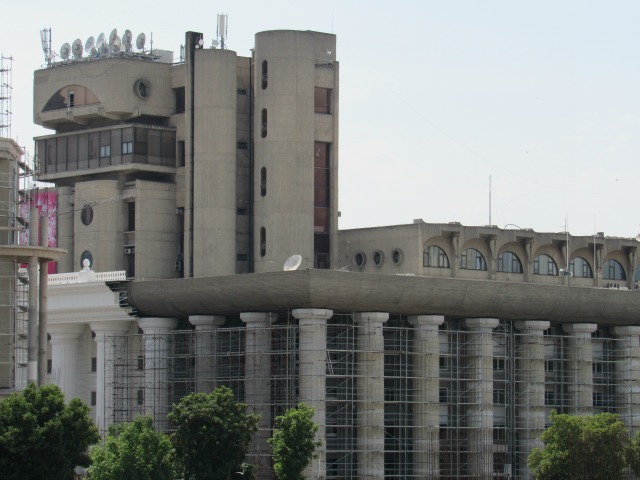 The government that came to power last year initially called a halt to all Skopje 2014 projects. There was even talk of reversing some of the transformations and removing of some of the excess. 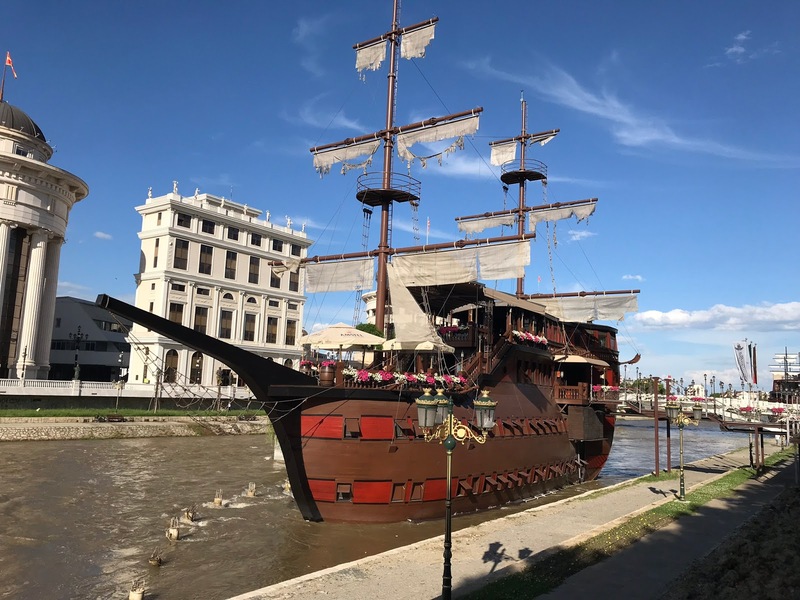 Yet construction continues on new projects while unemployment hovers near 25% and, by most estimates, nearly a third of Macedonians live in poverty. We have seen more beggars on the streets of Skopje than in all the other countries we've visited on this trip combined. Many children are involved in panhandling, whether with parents or on their own with parents watching from nearby. Perhaps in time, the new government will get a handle on the excess spending on frivolous and needless construction and begin to address the genuine needs of its people. We asked a young Macedonian father what he thought about the Skopje 2014 project and he gave us an earful. He traveled for 15 years working on cruise ships all over the world, so he has a broad and enlightened perspective. In his estimation, his country needs to remove some of the extravagant results of the construction that went overboard. He contended that Macedonia is making a mistake trying to ally itself with the EU and NATO because the people have more in common with the East than the West. In his opinion, Turkey is a more natural ally for Macedonia than France or Germany. But like most everyone else we met in the country, he was courteous and friendly and open to communicating with us. In contrast to the artificial carnival atmosphere around the central square, Skopje does have some genuine historical sites, particularly in the old city on the opposite shore of the Vardar River. 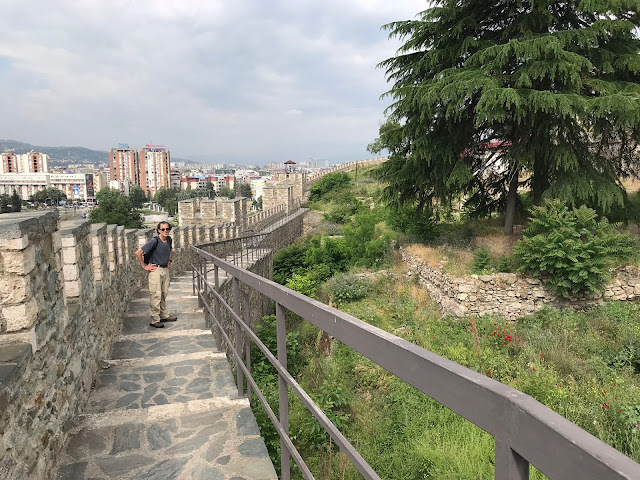 Perched on a hill on the city's highest point, overlooking the river, is Skopje Fortress. 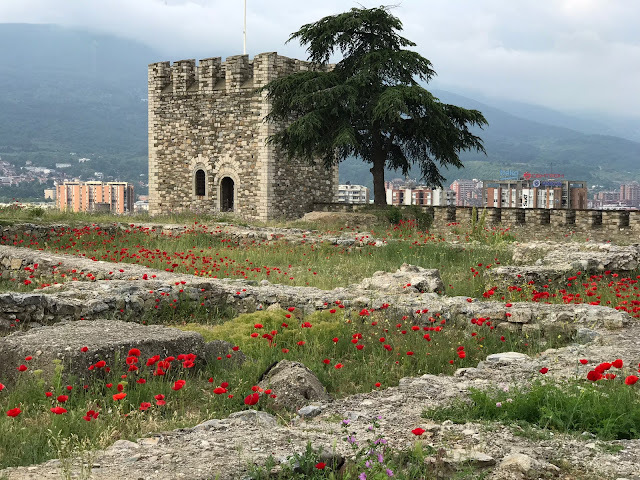 Poppies dominated the landscape at the fortress. In search of a letterbox, we climbed up to the fortress, only to find it alive with a profusion of wildflowers. 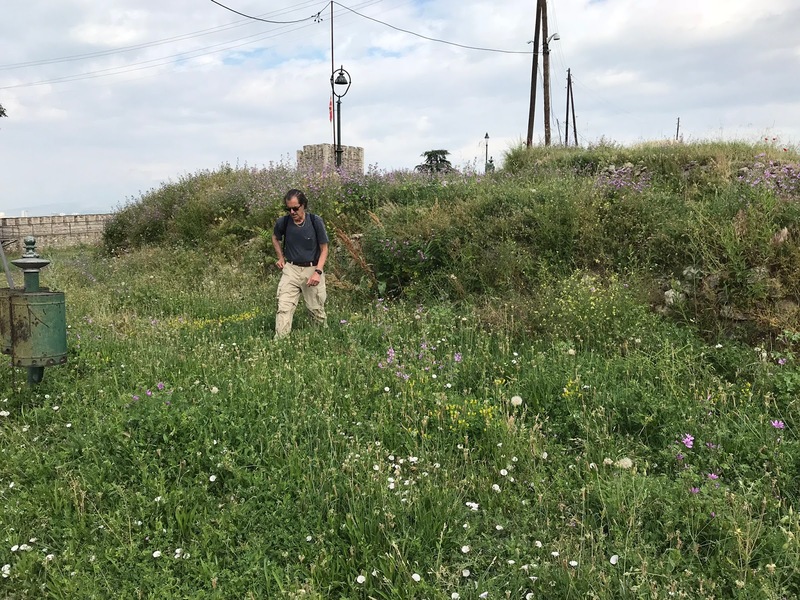 Though there was evidence that the compound had once been well maintained, it is currently overgrown with tall grass except along a few paths and the top of the wall. 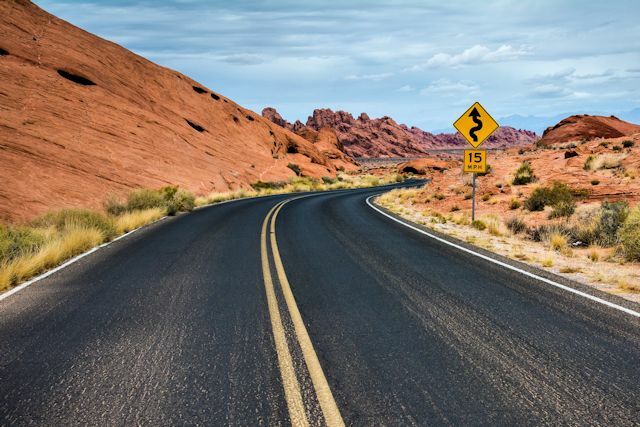 Being the dedicated letterboxer that he is, Ken waded through knee-deep weeds to locate the letterbox, ejecting several hitchhiking ticks off his pants legs when he was done. Another dose of Skopje reality occurred just after we arrived. The agent for the apartment we had rented through booking.com had asked us to meet him in front of the large St. Clement church, except there was nowhere to pull over, let alone park there. We found a parking place along a crowded side street nearby and met him on foot. 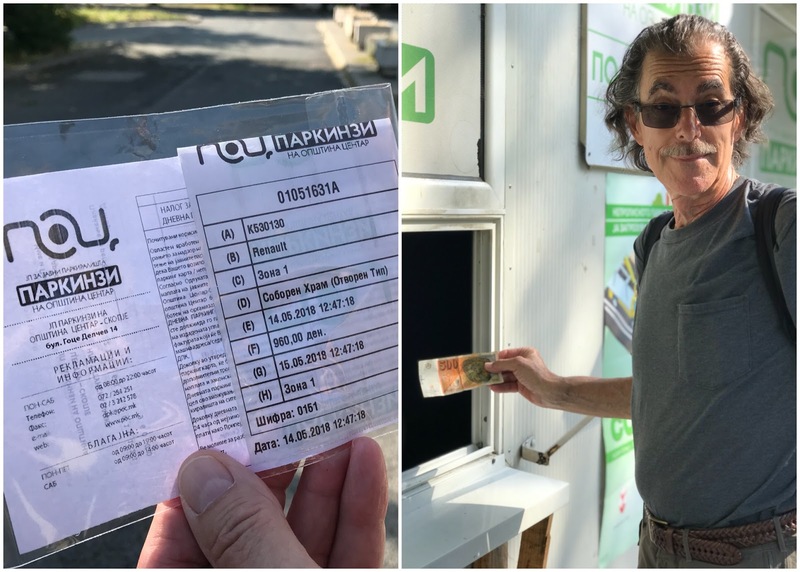 The ticket was encased in a clear plastic sleeve to preserve it in case of rain. By the time we returned to our rental car—after rejecting the smelly apartment he offered us—our windshield had been decorated with a parking ticket. We soon realized that the guy who was sitting in a chair next to the car was the stool pigeon who had notified authorities. Our ignorance of local parking regulations was no defense, of course. After moving the car to the garage at the Marriott where we had checked in, we decided to avoid the crazy city traffic and walk the mile to the office where we needed to pay our fine. Much to our surprise, the $18 fine was reduced to $4 because we had shown up so promptly to settle our debt and repent for our misdeed. 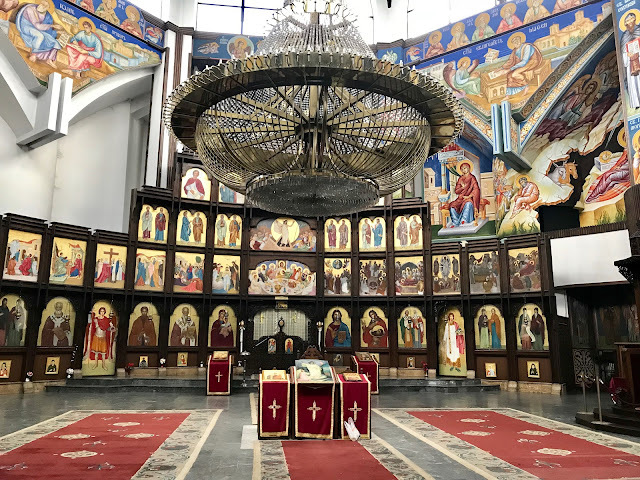 Though the three-dome church was not a great meeting place, we were intrigued with its design. Construction on the rotunda style building, composed only of domes and arches, was begun in 1974, with the building consecrated in 1990. 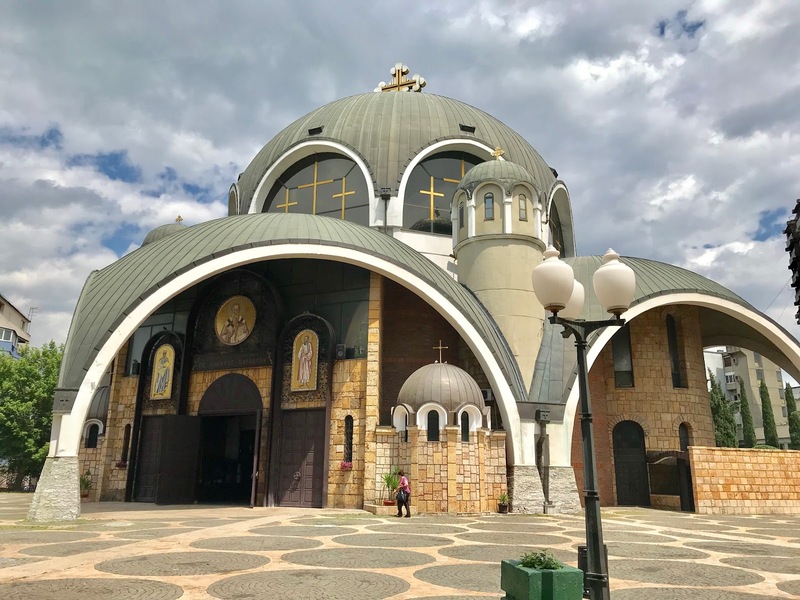 It became the center of the Macedonian Orthodox Church, which declared its independence from the Serbian Orthodox religion in 1965. 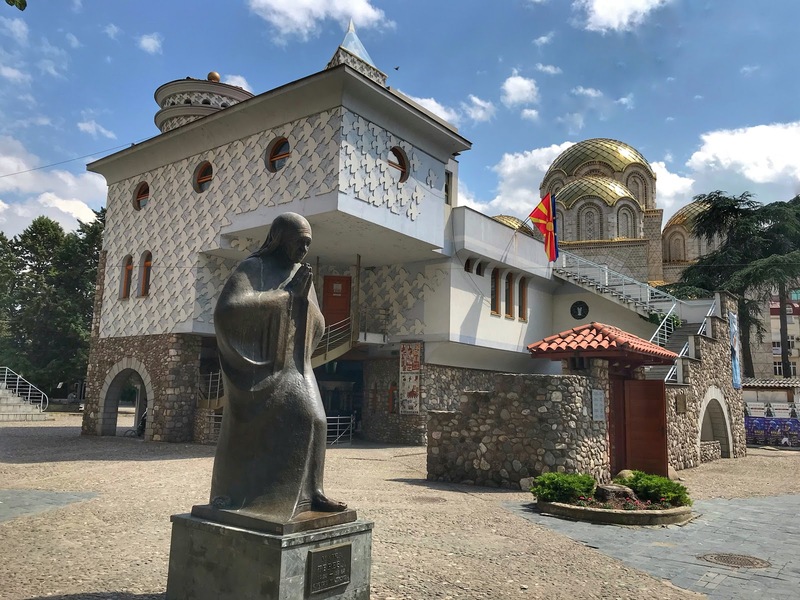 Skopje's best known religious figure was born in the city in 1910 and lived there until 1918, when she left Macedonia to serve the Roman Catholic Church. In that role, she later became known around the world as Mother Teresa. At the place where she was born, the Memorial House of Mother Teresa was opened in 2008. Conceived as a modern transformation of the house where she lived her formative years, the building houses a museum about the life and work of this beloved native daughter. 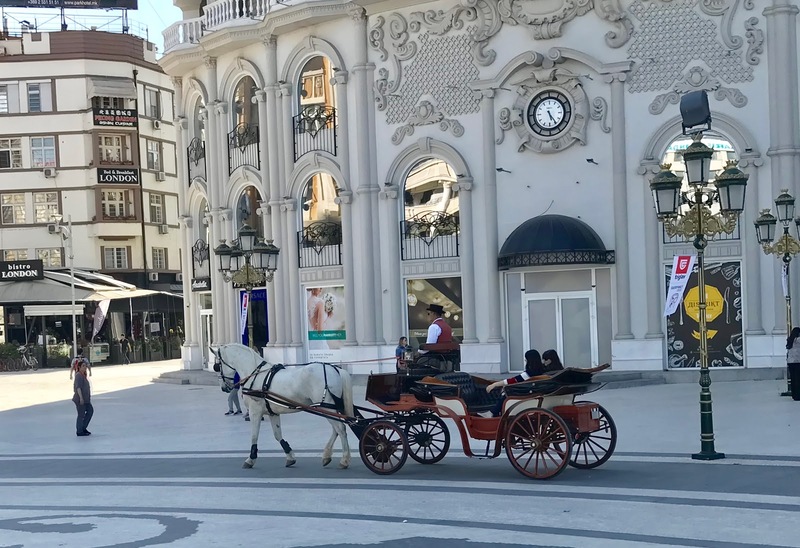 When she was a child, it's likely that Anjezë Gonxhe Bojaxhiu visited the shops of Skopje's Old Bazaar, one of the oldest and largest market places in the Balkans. The city's center for trade and commerce since the 12th century, the bazaar today is home to hundreds of shops and stalls selling all manner of goods. As we've often seen in such markets, most shops concentrate on one type of merchandise and are grouped with other stores selling the same products. 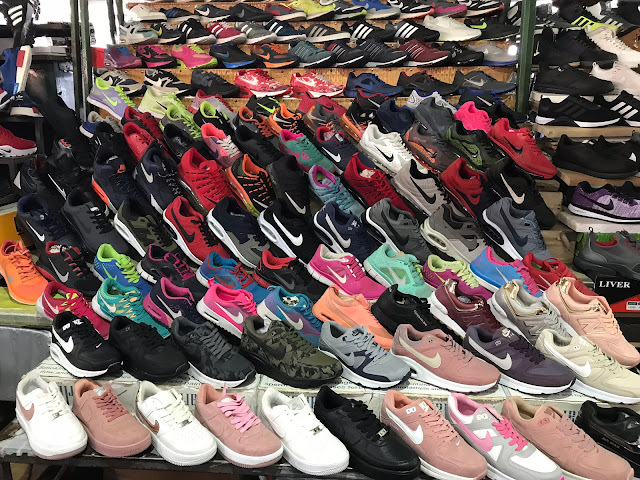 Scores of adjacent storefronts offer a dizzying array of shoes, with every possible style on prominent display. 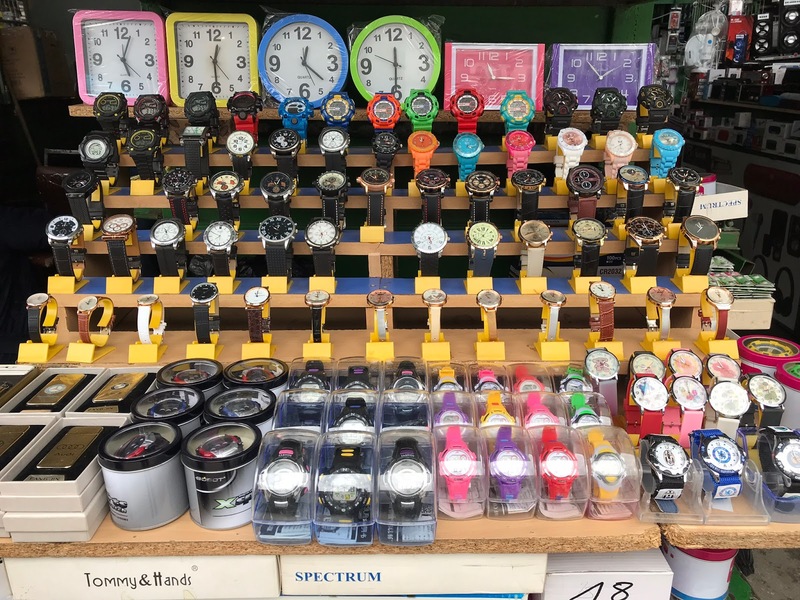 Based on a cursory examination of the quality of the wares, the authenticity of their mainstream brand labels seemed questionable. 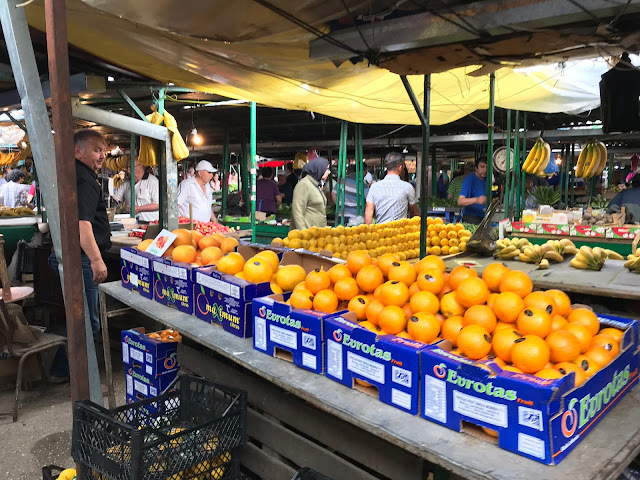 On a Tuesday morning, as we walked through, the market was jammed with customers of all ages. On our last day in Skopje, we decided to escape the hustle and bustle of the city and its faux architecture and drove ten miles southwest of the city to Matka Canyon, one of Macedonia's most popular outdoor destinations. 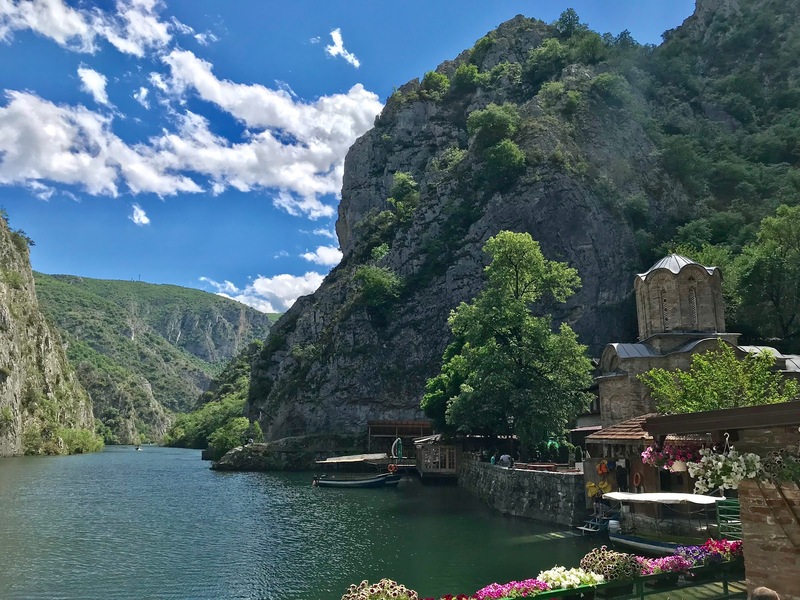 The Treska River, which created and flows through the canyon, was dammed in the 1930s in the creation of the country's first hydroelectric plant. A historical exhibit at the plant relates its history, as well as a brief history of humans' harnessing and use of electricity. 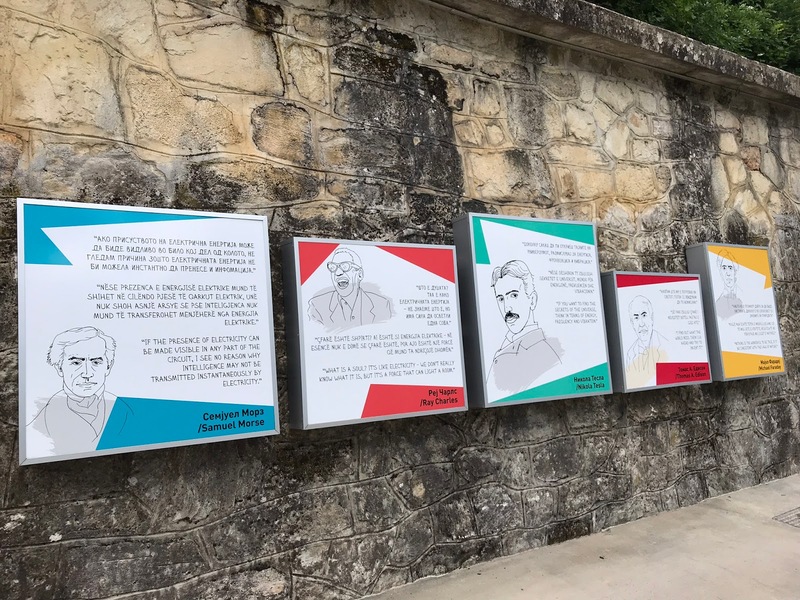 Quotes are featured by prominent scientists in the field, such as Faraday, Edison, Tesla and Morse. What a delightful surprise to see Ray Charles (yes, the American R&B singer) amidst this group with his own quote: "What is a soul? It's like electricity—we don't really know what it is, but it's a force that can light a room." A well-maintained stone path leads from the power plant, beyond the dam, along one of the canyon walls to a tiny 'village' along the shore of Matka Lake. 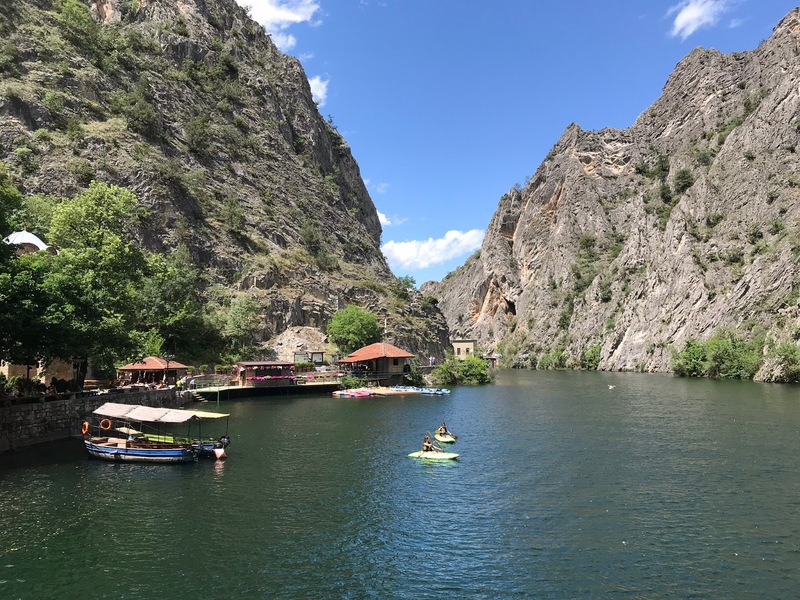 There are the expected boat and kayak rental services and restaurants serving the needs of those who wander further into the canyon as well as the day trippers whose venture stops there. 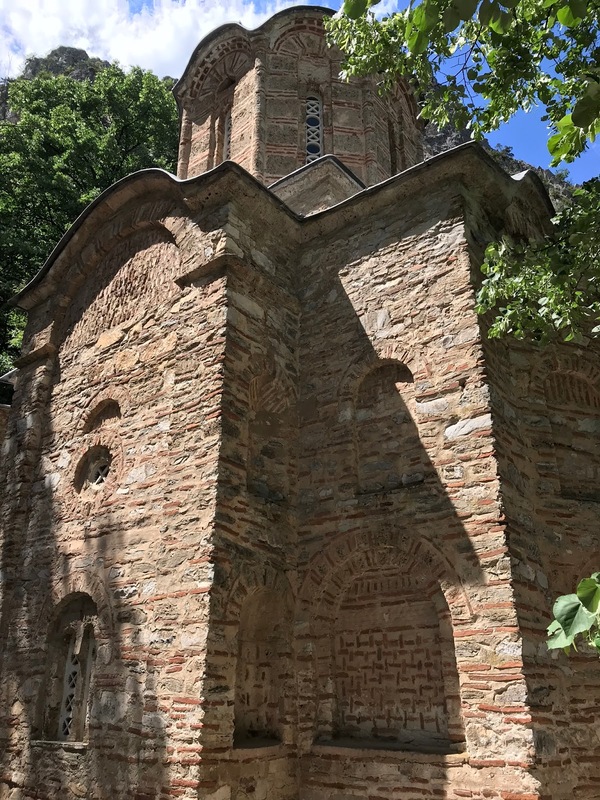 At the heart of the commercial area sits the Church of St. Andrew, a fixture in the canyon since 1389. Inside are frescoes dating from mid 1500s when the church served a monastery dedicated to the apostle Andrew. Our day trip to the canyon was a welcome relief from Skopje's excesses. We returned to the city to pack up and prepare for our drive tomorrow to Kosovo, the final country in the Balkan part of this adventure. • Quote of the Day: (Ken on what he would do in an average-sized US car when meeting a tour bus on a narrow Macedonian road): "I would get out of the car and run!" Loved: Before we learned of the story behind the Skopje 2014 "landmarks," we actually thought the kitschiness of the city was pretty fun. A bit like Vegas in the Balkans. 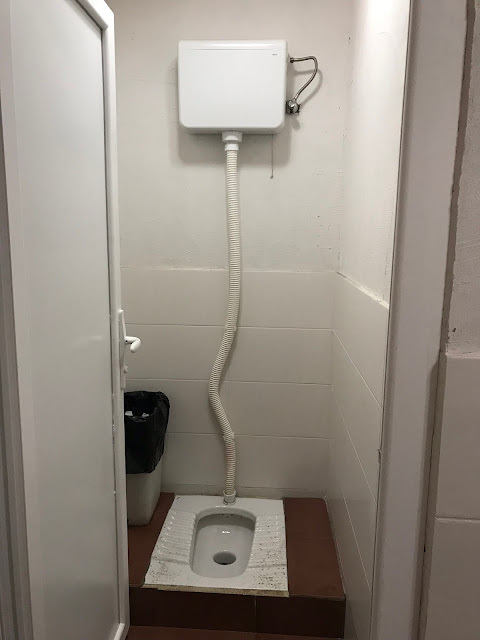 Lacking: Litter control. The parts of Macedonia we visited have had the worst litter problem of any place we've seen on this trip. 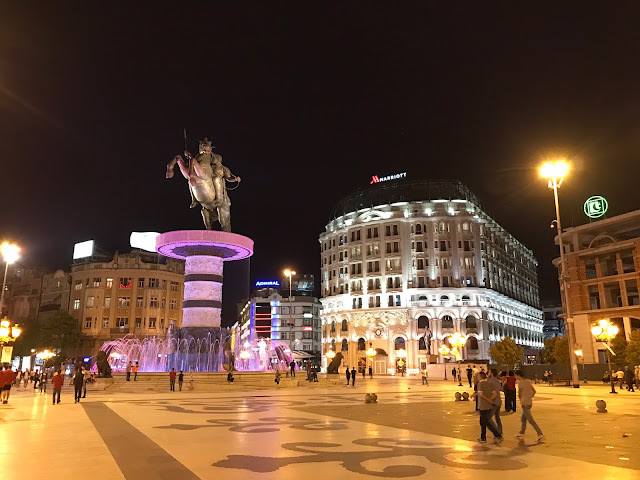 From the main glorious square with all its statues and fountains and lights, a few steps around a corner leads to an area whose main feature is its excess of unmitigated litter. Learned: Without exception, in every Balkan country we have visited, we have heard from locals their grave concerns about the pervasiveness of fraud and corruption which seem to run rampant in each country's government. Giant lions guard a bridge over the river. With all this fake antiquity, a horse and carriage ride couldn't be far behind, though we saw only one. All aboard! cried the local ticks. One of the few spots in the fortress not overgrown. At the canyon village, I finally learned to use a squat toilet.